If you thought remote controlled cars were only for young kids, you’ve obviously never met the GPTOYS Off-Road Monster S916 Remote Control Truck. 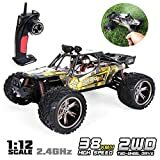 As the name suggests, this RC truck is no joke and can be driven off road over all sorts of obstructions. But the real fun comes when you place it on pavement and accelerate to a top speed of more than 26 mph! It’s well worth its $80 price tag on Amazon, but the coupon code PW5PWPLX will let you snag one for just $63.99.